Is it a bird? Is it a plane? No, wait...It's a Kindergartener! This year I decided to be adventurous and try something I never attempted before. No risk no reward, right? It began with a simple assignment I left for my sub one day. I found on Teachers Pay Teachers a superhero design sheet. It allowed students to design their own superhero. Students had to come up with a name, characteristics, and superpowers for him/her. The goal was to keep students occupied during my absence. I also wanted it to be a fun and creative writing project for my students. They got so invested in it and loved designing their own superhero that I decided to make this a bigger project. This would be a great opportunity for students to use their writing skills to spread kindness and thank our kindergarten buddy class. During PARCC testing each 3-5th-grade class is paired with a K-2 grade class as their buddy. The younger students do not test. Instead, they deliver little gifts and words of encouragement to the older students during PARCC testing. It's fun and sweet and the older kids love seeing the little ones. It brings a smile to their faces during the long PARCC week. I thought it might be nice for us to say thank you to the kindergarteners who gave us kind words and support. Thus, began Top Secret Plan: Superhero Story. After emailing the teacher and getting her class list, I informed my authors of their brave task. The task was to create a superhero story that had a kindergartener as the main character. To be honest, I thought a few of my students would reject this challenge at the end of the year. Yet, no one complained. They knew it was a gift. A student was depending on them and they did not want to let anyone down. This took about three weeks total. The students filled out a plot page (which I created) on Google Docs with the very basic parts of their story. They had to go through their draft with me before advancing on to Google Slides. 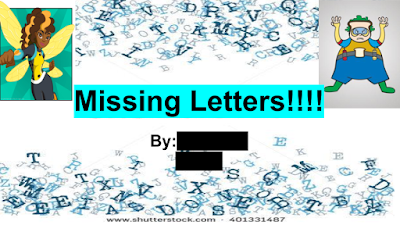 This was to ensure that grammar, spelling, and sequence were appropriate. Each Google slide became a page in their story. It was cute to see how they incorporated the kindergartener and the stories they created. The students had creative freedom so their stories were so different. I loved how some students used the different point of views. While others used real world problems like pollution. Students were to write at least ten pages. This was to make sure no books were too short. Students got to design the cover, add appropriate online images, or draw their own after completing their story. I emphasized that they needed all the words typed before designing. I had students peer review each other's stories before they came again to meet with me for the final edit. Once completed, the stories were printed in color and bound like a book. Students then gave the book to their kindergartener. Each student was given the opportunity to present their book to our class. Many were so proud of their creations. What was even better is when we surprised the kindergarteners. They had no idea we were coming (besides the teacher of course) and welcomed us with open arms. My students got the chance to share their stories with the students that characters were based on. There was so much joy in every students' eyes. There were some little ones who were screaming for joy when they heard their name in a book. My students could not stop talking about this experience. When they left the classroom, each child sharing how their kindergartener reacted. They got to pay it forward and in their own way share kindness. They were able to make someone's day. That is priceless. What did we learn? Students worked on plot, narrative writing, editing, revising, presenting, and using digital tools. An important life lesson learned was kindness. It was about doing something for someone when they have not asked anything of you. Saying Thank you to those around you and finding joy in surprising others. I have always enjoyed surprising others. Whether by creating homemade gifts or something giving them something they enjoy. One story I share often with my students is the story about how I feel when I see my grandmother open a Christmas gift. A gift I have worked days to complete. From spending several days drawing my grandmother or the family tree I painted for my mom. It's always been something I find joy in and I got to share that with my students this year. They got to have that feeling surge through them and bring joy to others. I learned something too. I learned that it is okay to jump on an idea and see where it takes you. This could have tanked and I will admit the timing was not the best (weeks away from the end of the school year), but we did it! The end result was worth all those hours spent working on the project in class. The time dedicated to it in my class was well worth it. I hope that I can continue this type of activity with future classes. Also, I learned that tech tools can do such much more than we thought. I had never before used Google Slides other than to create presentations. Using it to make a picture book was a great idea. It allowed my students to have so much creative control over their work. It also allowed for so much peer teaching in the process. Have you ever taken a risk on a project? How did it go? How can we encourage more teachers to take risks? What kindness projects do you do or would like to do? Creating a classroom community is important to getting the school year off on the right foot and making the school year more joyous. I feel there are so many ways to instill that classroom community within your classroom. Many teachers, especially in the the primary grades, use their calendar or carpet time as a great way for students to share and learn from one another. Students need to make those connections and have their chance to share their stories so they know that they matter. It also allows students to realize all the things they have in common with each other. Recognizing and seeing similarities can help create a family atmosphere in the classroom cutting down on so many behavior issues. I have had the opportunity to teach primary and upper elementary and students regardless of age just crave the time to communicate, share, and have fun with one another. When I started teaching 5th grade three years ago I wanted to find a way for my students to create bonds and for me to learn more about them. I knew that the calendar time that I did with my 3rd graders would not be the right choice for fifth graders. So I did a lot of research. 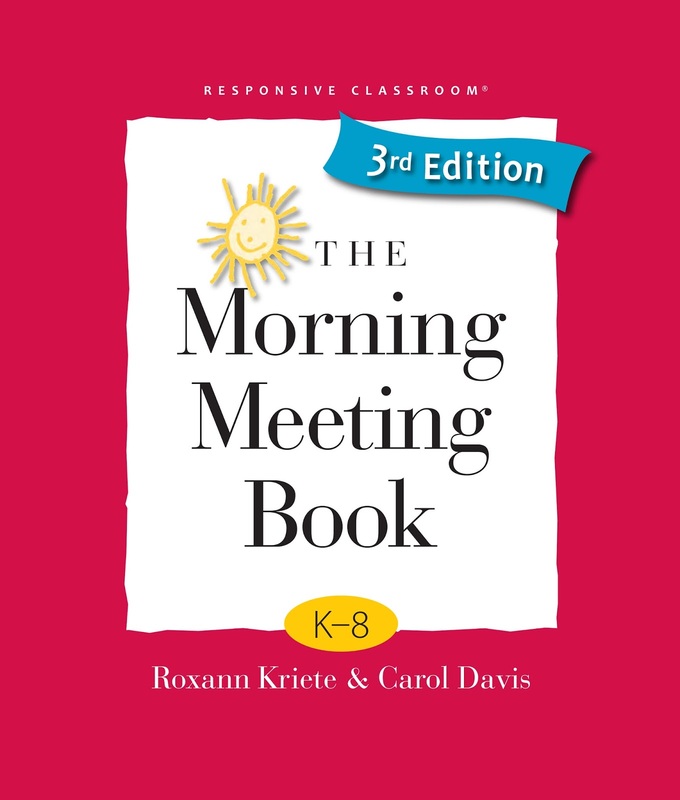 I picked up the Morning Meeting Book by Roxann Kriete and Carol Davis. I also talked to a fellow teacher who did Morning Meeting in her classroom to get ideas. I ended up with a hybrid that worked for me and allowed me the chance to build a community while balancing curriculum time that always seems to be cut down. I wanted to try and keep as much teaching time as possible because my students truly needed it, but I recognized the need to build a caring and respectful community. So I decided every morning for the first quarter we were going to have a Morning Meeting. I really chose to focus on the students having the ability to share their life with others and the chance for students to bond over games or stories. I think student voice and movement in general is a great way to start the day. It gives students the time they need to settle in and get ready for the day. Now before I get into my morning meeting schedule I want to preface this by talking about rules. Every year when I'm introducing Morning Meeting to my students I talk about what it is, why we do it and the schedule of things we do. Following that discussion we create a list of rules. Students share what rules they think will be important to follow during Morning Meeting and I write them on a big piece of chart paper. Everyday, for the first few weeks we start our meeting by reviewing the rules. During the meeting time I give reminders or talk to the students about what rules we need to work on and we work towards that goal. It's important that the students have a voice in the rules so they take them to heart and monitor themselves as well as one another. My Morning Greeting changed daily but revolved around the students learning each others names, greeting one another in different ways, and working on acknowledging one another. I had simple things such as shaking hands and saying good morning to people by name. Yet, I also have them high five as many people as they can in 30 secs saying good morning. I try to switch it up as much as possible to keep my students on their toes. I also want them to recognize each other and realize that we are family here. My favorite greeting is when the students pick a name from a hat and say good morning to that person, but also compliment them on something they have notice they have done in class. Students acknowledging other students allows them to build a bond between each other that that means more than any that come from me. It also helps the students see the good in others and feel personally recognized. Teacher's News of the Day is just a chance for me to share with my students all the different things that are going on that day or later that week. I let my students know all of the school events, share any national holidays, or even promote any new books being placed in my classroom library. I try to use this as a quick time to share with my students and get them excited about anything going on in our classroom or in the school. You could use this time differently such as focusing on a classroom standard, review a skill, or sharing a challenge of the day. Student Check In & Share is of course the favorite time of the students. During this time the students check in with me about how they are feeling that day. They rate themselves on a scale from 1 to 5, 5 being super excited and happy, while 1 is seen as having a rough day. This is a tremendous opportunity for the students to reflect on their feelings and for me to gauge how my students a coming into the school day. When I say "Check In" the students hold up their rating using their fingers. I take this moment to scan the room seeing everyone's rating before asking if anyone wants to share their reason why they are feeling that way. This is the moment that students love. They get to explain that they went to Fun City last weekend and had a great time swimming or that their birthday is coming up. You also have students who share that they had a hard time sleeping because their baby sister cried all night . In these conversations students laugh together, ask questions, and share common experiences making them feel connected. I often tell the students I am only going to call on 5 people to share, but then I call on different students the following day. It saves time and provides some restrictions. I spend time at the beginning really coaching my students on proper ways to share and proper ways to respond. We want everyone to feel included and that if they do share they won't be disrespected. In adolescence students number one fear is not fitting in or just being made fun of so sharing can be hard, but with the right coaching and rules students will surprise you. One thing that the Morning Meeting Book really helped with was all the different games. I had a bunch from my time as a camp counselor, but this book has so many other ideas that I just loved using with my students. Games seem to some teachers to be a waste of time, but truth be told that is where students engage the most, especially when it comes to building on teamwork and communication skills. Now at times I subbed my games for more educational ones or stem activities that still brought students together. Regardless of what you choose the key is to sell it. You have to make it fun and don't be afraid to play along with them. Students regardless of age will look to you and will have so much fun if your playing along with them. If you are looking for activity ideas, games, or projects there are so many free ideas online. Check out Pinterest and Teachers Pay Teachers for some ideas. What I have realized is there is no one way to do a Morning Meeting. That as long as your giving students a chance to form a community by interacting with each other you are doing it right! 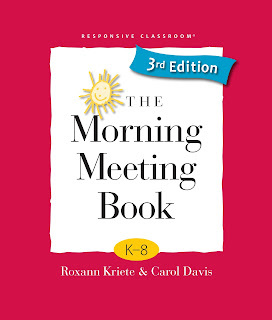 What are your thoughts on Morning Meeting? Do you do one in your classroom? How do you run yours? What are your favorite activities? Share your thoughts on Twitter @teaching_power or on Facebook! Have you used Readworks? If you haven't you really need to check it out! In today's tech suggestion I'm going to be discussing Readworks and why it is such an amazing free digital tool for teachers. Last year, I was told by another teacher to check out the site Readworks. I instantly fell in love! This site allows teachers to find texts to use in class based on subject matter, grade level, lexile level, type of text, or even skill. I started using this as a way to choose text and easily differentiate based on my students needs. It has a variety of both fiction and nonfiction passages that are of high interest to students. This past year I have been using the Readworks Digital option in class. It has been a game changer. In my school we are one to one chromebook devices which makes this digital option an amazing tool. I can create a digital class on Readworks and select a text and questions for my students to answer. I love that it allows me to post it to Google Classroom so students can immediately click the link and log in for their assignment. It also is easy to differentiate the readings based on the students reading level. In some cases you can assign the same reading at different levels. The best part is it automatically grades the multiple choice questions for you. As a teacher, all I need to do is go in and hand grade the short responses. I use this tool when I have substitute or when I'm pulling groups. Students might read the text with me and then do the questions at a separate rotation or even on a different day. I have also given harder texts to challenge my higher level readers. They read and take notes independently. Then when they come to small group we reread and discuss before they begin the questions. Readworks Digital allows students to highlight the text and make notes as they go. I actually taught my class as a whole group how to use these tools using a 3rd grade text. They are so easy for the students to use and allows them to continue to use the note taking skills I teach them even on the chromebook. They love to mark up the text using different colors and even reference them in their answers to questions saying things like "this is shown in the text as I highlighted in yellow." I love it because it makes looking back in the passage fun because they get to use the highlight tool and to some of them just enjoy using technology in different ways. Making an account is so easy and most importantly it is free. Once you have an account you can save articles, stories, or passages so you can use them later on in the year or even the following year. They have other resources that you can use such as Article of the Day that focuses on reading fluency and note taking skills. They also have lesson plans to go with popular books or novels for grade levels that interweave paired Readworks Texts to support different skills. There is even a way for you to find lessons or passages that focus on specific standards. Need I say YAY! Though I don't teach younger grades using the Readworks Digital you can search for readings that students can have read to them which can be a center in itself. There feel like a million ways you can use this tech resource that I highly suggest you look into it right away! Also check me out on Periscope @teaching_power for my Sunday morning coffee talks! During the year I cover Author's Purpose and the acronym PIE'ED is used to describe the many different types: Persuade, Inform, Entertain, Explain and Describe. This can be a tough concept in the beginning for some of my students, especially when it comes to differentiating between them. It can also be a dull point as well. Students reading passages and just labeling them based on evidence can be daunting or worse yet boring, but thanks to Hope King and some amazing game creators it doesn't have to be. About a year ago I saw one of Hope King's blog posts on Elementary Shenanigans that I just had to try out. She turned her classroom into a bakery and during her Language Arts lessons students worked together to sort through task cards with different passages to decide what the authors purpose was of each. In the process, they got to play Pie in the Face. If you haven't had the luxury of playing this very fun and very messy game, the idea is that you put whipped cream on the arm piece and based on a spin of a spinner you crank the little cranks that many times. If your lucky nothing happens, but sometimes you get pied in the face. Hope created this whole lesson to drive engagement in the lesson and bring life the "Bakery" story she created. I decided to use this lesson to inspire my own bakery inside my classroom. Similar to Hope, I bought colored table cloths at Dollar Tree and got pie tins. I also purchased face wipes, paper towels, and whipped cream for each table. After setting up each table I put one set of Pie in the Face game at each table. I was fortunate to have four. Lucky for me they were 70% off at Walgreens the last time I went in. I also chose to print out task cards in the form of a packet for ever student. To make the lesson more manageable I had students work together on one page at a time. They had to read through the task cards then discuss the answers. I chose to use task cards that were multiple choice, but you could just use reading passages/ excerpts. Students debated and discussed and once they finished the entire page they would check in with me. I would tell them if they needed to correct one or not. If they had them all correct the Miss Lee's Bakery tradition was before they could move on they must play a round of Pie in the Face to celebrate! The students had a blast! 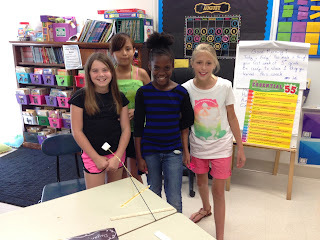 They loved using this activity to review what we have been studying all week. Following this activity, I created a pop quiz for students which included some questions about authors purpose as well as actually labeling and explaining the authors purpose of five passages. This of course wasn't the most exciting part of the lesson, but I acted as though this was the exam that allowed students to become true bakers. Since I teach all subjects to my students I wanted to make sure the rest of the day followed the morning theme so during math I decided to work on fractions and perimeter and area working through a packet that allowed students to create their own bakery and baked goods. The students really enjoyed it and had a great time working in pairs creating logos, commercials, and designing their bakery. I will say that this required more time than I had for one lesson so it became an enrichment project that students could work on in their free time. Also, I decided to conduct my Mystery Airhead experiment for science which had students work through the observation skills as well as using support to deduce the Mystery air Head flavor. Overall, the day was long but very exciting for the students and I. They loved wearing their chef hat and aprons and didn't want to take them off when it was time for PE. It was so nice to see such engagement and joy in my students faces and moving forward I plan on building this into my lessons and making this a truly fun filled, learning centered day. Also, many of my lessons are semi homemade and based around Teacher Pay Teacher materials that I find so check out the links below if you are interested in some of the items I used to piece my lesson together. Also, if you are not already following Hope King at Elementary Shenanigans you need to! 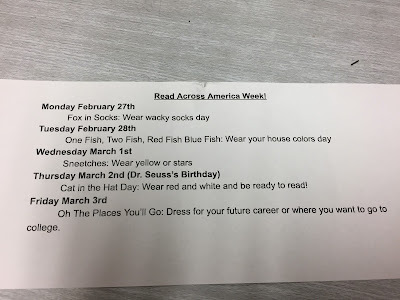 March is coming up fast and this past week our school did a school wide spirit days in honor of Dr.Seuss. This amazing author will always be one of my favorites and regardless of age of the students in my class, I will continue to read to them these classic books because they have such meaning ingrained in them that they speak to all generations. My first classroom was Dr.Seuss themed and I just loved being able to pull in his books to teach lessons. As I moved grades and was placed in 5th my classroom theme changed from Dr. Seuss to Hockey (another love of mine). Yet, I still tie Dr.Seuss into my school year. I love using Sneetches to discuss the Civil Rights Movement or Lorax to discuss environmentalism. Of course, there is not a year that goes by with out me reading my favorite, The Grinch Who Stole Christmas, while the students discuss plot and figurative language. Dr.Seuss will forever be a favorite so I had to make his birthday a big deal. March 2nd is Dr Seuss's birthday which has become a school holiday in its own right called Read Across Amercia Day. Schools celebrate in their own ways and make plenty of time to read on this day in honor of a man who did so much for children's literature. In the past two years I have celebrated this week with my 5th grade class tying skills or lessons to different Dr. Seuss books. I will always remember the joy of my first year when my students brought pillows and read in the dark with flashlights for "All the Places You Will Glow" Day. My 5th graders were beyond excited to do it and it was refreshing to see them just enjoy a good book. This year I have had a chance to help with House Council (our schools version of Student Council). 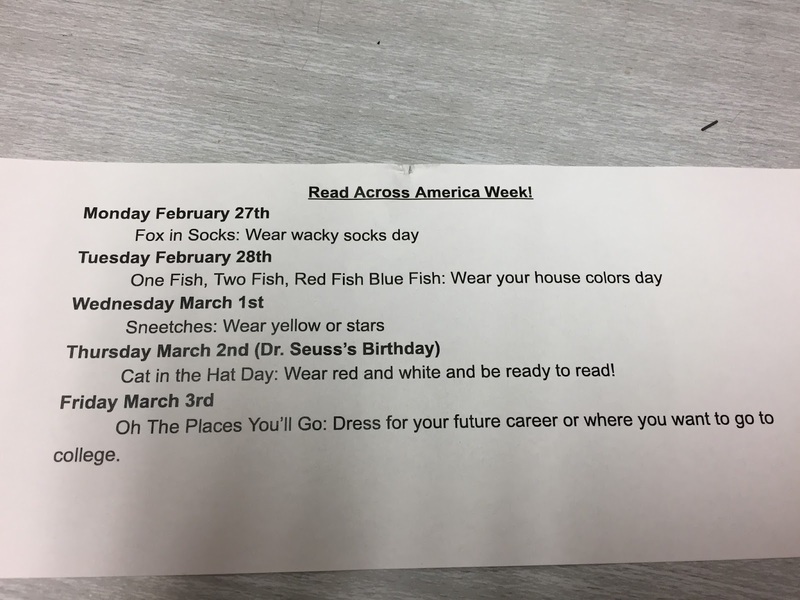 We created a school wide spirit week to promote school spirit and a love for reading! Monday- Fox and Socks Fluency Read Off: Students practiced then competed to read a passage from Fox in Socks. This works of fluency, friendly competition, and a reminder of growth mindset that we have bee discussing this year. Tuesday- One Fish, Two Fish, Red Fish, Blue Fish: Students practiced math skills by "catching" fish from around the room. I have cast out paper fish with different math problems on them, one per fish. Students worked in pairs to answer the math problem on the back of the fish and check with me to see if they got it correct. If they were incorrect they would have to try again, but if they got it correct they got to cast it back out and catch another one. I stole this amazing idea from a fellow teacher in the building who used it to practice for the quarterly assessments. I have also done the activity where the students have a packet of problems and have to "catch" a fish that only has a number on it, and based on the number they answer that problem in their packet. Either way it is fun for students to enjoy a good math fishing derby! Wednesday- Sneetches Debate: Students listened to the story The Sneetches and discuss how it relates to the Civil Rights Movement. This story has such strong ties to bullying and segregation that no matter the age I think it can be discussed and related to. If there is time next year I would like the students to debate to who is more at fault for the segregation the Sneetches or Mr. McBean (the machine owner who can change the stars). Thursday- Cat in the Hat Day: Students had a set time to read in the classroom and curl up with a good book. I had the students bring in pillows or a stuffed animal. I even took out my flashlights and had the students read in the dark. I wanted to make it a fun, comfy reading day to celebrate Dr. Seuss and his love for reading. Friday- Oh the Places You Will Go: As a class we will discussed SMART Goals and how to think about future. I want students to think about how much work and perseverance comes with going for your dreams. We will practice soft skills like handshake, conversations, and active listening. With any luck, next year I might be able to have a volunteer or two come in and talk about goals while also allowing the students to converse with them in small groups to practice their conversation skills. We Had a Blast on Cat in the Hat Day!